Revelations of the Unseen (Futuh al-Ghaib) - Discourses by Shaikh 'Abd al-Qadir al-Jilani. Perhaps the most well known collection of the great Shaikh's discourses, these short and powerful discourses cover topics of interest to every seeker of the spiritual path. A glimpse at the some of the topics covered will reassure the reader that the Shaikh is addressing issues that are as pertinent in this day and age as the day he spoke about them so many hundreds of years ago. Here is a small sample: On passing beyond the creation; On drawing near to Allah; On fear and hope; On trust and its stages; On how the contact [wusul] with Allah is attained; On not complaining; On the classification of the seeker's state; On the two conditions of the self [nafs]; On the reason for the trials borne by certain believers; On the seeker and the sought. The Sublime Revelation (Al-Fath ar-Rabbani) - Discourses [Majalis] by Shaikh 'Abd al-Qadir al-Jilani in the guesthouse [ribat] and the schoolhouse [madrasa] in Bagdad, between the years AH 545 and AH 546. Longer than the discourses of Revelations of the Unseen, these profoundly moving lectures used to be attended by crowds of more than seventy thousand people. As we have been told in the Shaikh's biography, Necklaces of Gems, more than 400 inkwells would be used in one session by the scribes recording his every word. Treasured for centuries by those fortunate enough to have a handwritten copy, the entire 62 discourses are available in English for the first time. These discourses cover every aspect of the spiritual path necessary for those who aspire to attain to the nearness of Allah. Translated by Muhtar Holland. 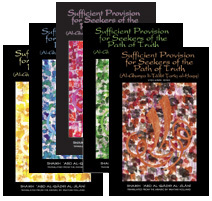 Sufficient Provision for Seekers of the Path of Truth(Al-Ghunya li-Talibi Tariq al-Haqq) - Set by Shaikh 'Abd al-Qadir al-Jilani (may Allah be well pleased with him) This encyclopedic work is a complete resource on the inner and outer aspects of Islam. The translation has been published in 5 volumes. Translated by Muhtar Holland into English for the first time, and over five and a half years in the translating, this work is undoubtedly the publishing event of this century and a treasure of unimaginable value to the believers. 1738 pages. Concerning the Affirmation of Divine Oneness (Risala fi't-Tawhid)by Shaikh Wali Raslan ad-Dimashqi (d. A.H. 540) - In the original handwritten manuscripts the Malfuzat is usually found as an appendix or attachment to Al-Fath ar-Rabbani [The Sublime Revelation]. It is a collection of many pieces of wise advice that do not fit neatly into the discourses in that book. In it are answers to questions put to him by disciples and those who attended the discourse sessions, extemporaneous advice, and most importantly, the Shaikh discusses the high level of aspiration possible for the ordinary person, and the way to accomplish it. First translation into English, by Muhtar Holland. Necklaces of Gems(Qala'id al-Jawahir)by Shaikh Muhammad ibn Yahya at-Tadifi (d. A.H. 963) - Biography of Shaikh 'Abd al-Qadir al-Jilani (may Allah be well pleased with him); on the Marvelous Exploits of the Crown of the Saints, the Treasure-trove of the Pure, the Sultan of the Awliya', the Sublime Qutb, Shaikh Muhyi'd-din 'Abd al-Qadir al-Jilani.This is the life story of the man who has been called the Sultan of the Saints (awliya') of Allah. In the history of the Saints of Islam, Shaikh 'Abd al-Qadir stands out as being unique, in the broad scope of perfection that includes his lineage, his complete development, piety, knowledge of the religion and adherence to the Sacred Law (Shari'a), his intimate and direct knowledge of the Divine, and his establishment by the Lord of All the Worlds at the level of Reality (Haqiqa). In this extensive biography we are given vivid glimpses of his charismatic exploits (karamat), many of which seem to defy the ordinary rules of nature. The book is also a small history of more than forty of the Shaikhs of his time, his companions of that day and age, as well as a description of his children, grandchildren and descendants.Translated into English by Muhtar Holland. Emanations of Lordly Grace(al-Fuyudat ar-Rabbaniyya)by Isma'il Muhammad Sa'id al-Qadiri - A collection of the work and explanations of Shaikh 'Abd al-Qadir al-Jilani (may Allah be well pleased with him), that includes definition and attributes of the seven selves [nafs], an explanation of the names of the seven stations [maqamat], the creed ['aqida] of the Supreme Helper (may Allah be well pleased with him), the meaning of the names of the Qadiriyya order, the remarkable virtues of al-Jilani the Qutb, the names of our master, 'Abd al-Qadir, litanies [awrad] for the taming of hearts and for emergency situations; how to offer the greeting of peace [salam] to the men of the unseen [Ghaib] and much much more. The Book of the Secret of Secrets and the Manifestation of Lights(Sirr al-Asrar wa Mazhar al-Anwar)by Shaikh 'Abd al-Qadir al-Jilani - This is the Muhtar Holland English translation of this precious work. Although there has been previously published an English interpretation by respected Shaikh Tosun Bayrak, this is the first actual translation into the English Language and includes transliteration of all Arabic key words. The contents are too diverse to describe here, but include: The shops of the spirit in the body; Division of knowledge into knowledge on the tongue and knowledge in the inner core; The number of the sciences; Explanation of the Sacred Law [Shari'a], the Spiritual Path [Tariqa], Direct Knowledge [Ma'rifa] and Reality [Haqiqa]; Concerning the people of spiritual culture [tasawwuf]; The difference between the ascetics and the people of intimate knowledge; Meanings of the term tasawwuf; The five tokens of bliss; The tokens of misery; The four domains, the spirits, the manifestations, and the intellects and so on. This is a most important book for anyone traveling the spiritual path. Twenty-four sections. I am one of the student seeking spiritual path that leads to Allah (swt).While reading words of Abdul Qadir-al jilani i felt they are still echoing in the physical realism as truth leading humanity towards God. His words and teachings are true guiding light to soul.